Golf course Home with Water View! Just Reduced! Interior Painted and PRICE REDUCED! 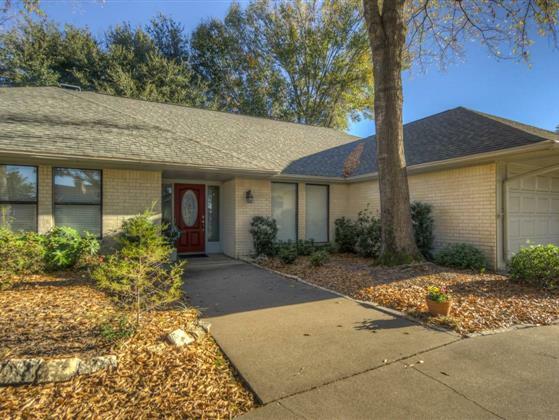 YOU WILL LOVE THIS GOLF COURSE HOME THE MOMENT YOU WALK THROUGH THE FRONT DOOR! THE VIEW ACROSS THE GOLF COURSE WITH LAKE PALESTINE IN THE BACKGROUND IS BREATHTAKING. THE SUN ROOM WILL OFFER A DIFFERENT AND BEAUTIFUL SUNRISE EVERY MORNING WHILE YOU ENJOY YOUR MORNING COFFEE AND/OR BREAKFAST. THE LARGE AND FUNCTIONAL KITCHEN OFFERS THE SAME VIEW WITH LOTS OF STORAGE AND COUNTER TOP SPACE. YOU WILL ENJOY FAMILY VISITS WITH A SPLIT FLOOR PLAN THAT OFFERS A LARGE GATHERING AREA AS WELL AS COMFORTABLE GATHERING AREAS FOR SMALL GROUPS TO ENJOY. THE ENJOYMENT EXTENDS TO THE OUTSIDE COVERED PATIO AND FENCED BACK YARD. THE HOME HAS TONS OF STORAGE SPACE BOTH INSIDE AND OUT. THIS HOME IS MOVE IN READY. DON'T MISS THIS ONE! $5,000.00 rebate with full price offer! Serving Flint, Bullard, Gresham, Chandler, Frankston, Tyler, Emerald Bay, Eagles Bluff, Lake Palestine and surrounding areas.